I am never hungry first thing in the morning (I know, I know, breakfast... most important meal of the day... blah-blah-blah), it takes me a while to be hungry, so I bring something to work, and join my students. We serve a breakfast-like, morning "snack" in my classroom, as I know some of my kiddos don't get breakfast at home. Everyone sits at the table, we practice things like manners, holding utensils, naming foods, communicating with our friends. All good stuff. So, I bring my breakfast and eat with them. Usually just a bar, or a bagel, but lately I've been craving something more hearty (and WARM!) like oatmeal. So after a little research online, I combined what I liked from about ninety-five Pinterest recipes and came up with exactly what I liked!! It's SO good and hits all the things I love in a hot cereal - loads of fruit, nuts, seeds and texture! You won't need a lot, it's very filling. Just dump 1/2 cup or so in a little jar, and you're good to go. And as a bonus, it looks all cute (and convenient). 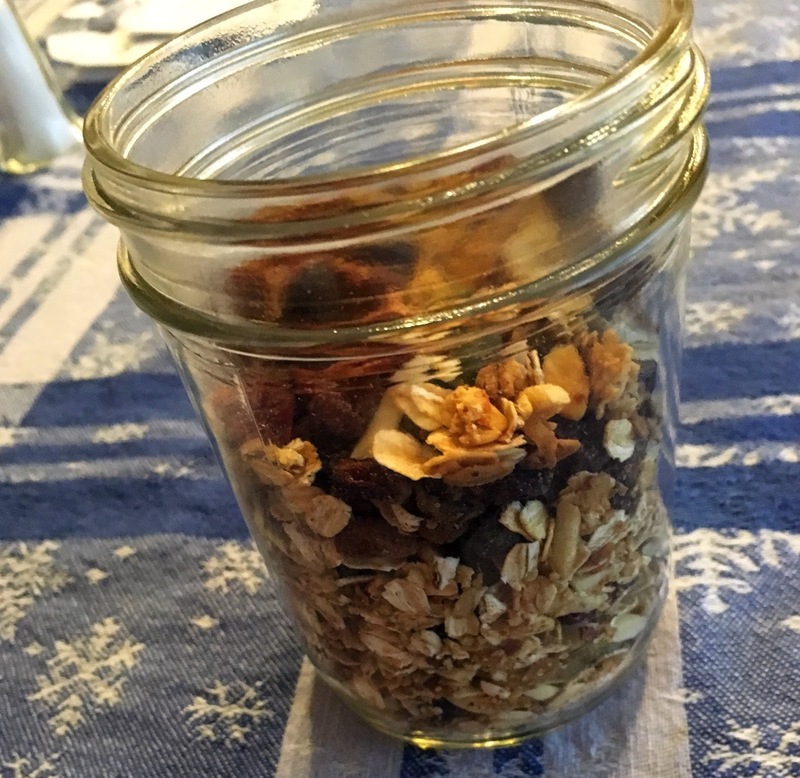 Apparently oatmeal in a jar is a trendy thing, who knew? Anyway, if you'd like to make your own, here's a rough guideline - feel free to add or delete whatever you like! Before scooping out a serving of oatmeal, I gently shake up the mixture to get an even distribution of the ingredients. I only make about a weeks worth at a time so I don't get tired of the same combo and to be sure that it stays fresh. If you can find other rolled grains, I think they might be interesting too? I'm not that adventurous. Preheat oven to 350°.Spread the oats, nuts and seeds on an un-greased baking sheet, just like you're making granola. Toast for about 10-15 minutes. Turning, or stirring at least once. Let the oats and nuts cool, then pulse just a few times in a food processor to VERY lightly chop. Mix with the rest of the ingredients and stir well. 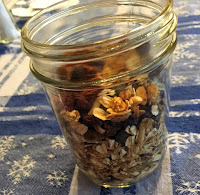 To serve, scoop out about 1/2 cup of the mixture into a mason jar and when you're ready to eat, and add hot (almost boiling) plant milk or water to just cover the oatmeal. Stir, cover and let it sit for 2 to 3 minutes.